I just got back from a week in Southern California visiting my sister. It was a fun trip! California weather was great–sunny, cool, fall-like, and very much like Houston’s. I assumed the weather would be similar when I got back home, but Texas decided to welcome me back with a cold front instead. It’s in the 40′s today in Houston (is that normal?) and all I can think about is making soup and drinking hot chocolate. This hot chocolate is pretty decadent and contains both bittersweet and milk chocolate. The bittersweet chocolate makes this drink dark and rich, while the milk chocolate adds some sweetness for balance. Combining the two chocolates with milk makes for a great hot chocolate on its own, but I decided to add a bit of peppermint extract to this batch for a festive touch. I’m a big fan of chocolate and mint together… peppermint patties, mint chocolate chip ice cream, and peppermint hot chocolate are all on my favorites list. If your idea of hot chocolate comes in a packet, I urge you to try making it on your own. The list of ingredients is short and the process is just as easy. I love adding a candy cane in my mug of hot chocolate because it does two things: it makes the drink prettier (I’m all for the pretty) and it adds an additional peppermint flavor and sweetness as it melts. 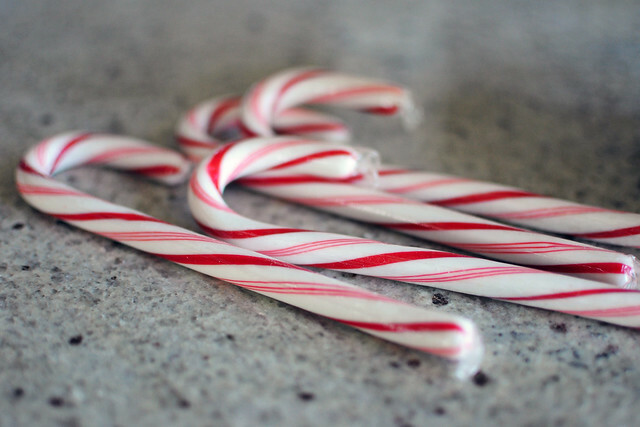 If you don’t have any peppermint extract on hand, you could get away with just adding a candy cane stirrer to your hot chocolate for that kick of peppermint. Drinking this reminds me of why I love this time of year. All I’m missing is a fireplace to sit in front of! In a medium saucepan, heat the milk over medium heat. 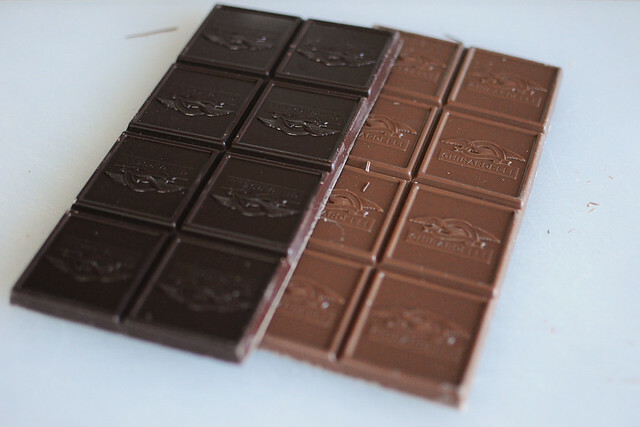 While the milk is heating up, chop the chocolate with a serrated knife (the smaller the pieces the faster they will melt). When the milk is just about to simmer remove the pan from the heat and add the chopped chocolate. 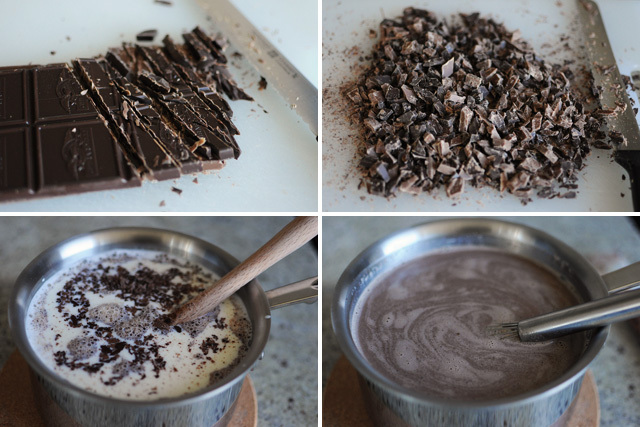 Stir the mixture with a rubber spatula until the chocolate has melted and then whisk in the peppermint extract. 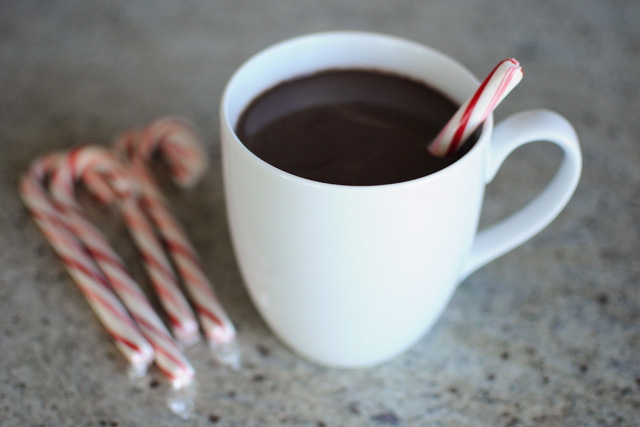 Reheat the hot chocolate on low heat and serve warm with a candy cane stirrer.